Olivier Durbano’s Citrine fragrance has been on my mind since I first smelled it last fall, and it’s in the running as a candidate for my first full-bottle purchase of 2012 (that is, if treating myself to a Frederic Malle candle, $95!, does not win out). Citrine is in the Durbano “Parfum de Pierre Poèmes” line, and it includes fragrance notes of lemon, orange, mimosa “buds”, ginger, pink pepper, incense, myrrh, carrot seeds (“sprouting” in many scents lately), musk, rosewood, gaiac wood, beeswax and amber. Citrine opens with pungent, “hot” citrus, as if the heat of ginger root and peppercorns has been added to lemon juice (don't wear this if you have a sore throat!) There is a floral sweetness in the opening too; it doesn’t register as “mimosa” but it’s pleasant and adds some “lift” to the fragrance. As with many other Durbano perfumes, incense plays a role — this time the incense is dry and camphorous, and it hovers in the background. Citrine’s base “glows” (it’s warm and dry with notes of beeswax, vegetal musk and rosewood). Smelling Citrine in the extreme dry-down reminds me of “mossy” citrus perfumes of yore (though I have no idea if there’s any, or much, moss in the mix). As with many citrus perfumes, Citrine does not show its true self from gentle dabs of the fragrance on the wrists. Dabbed on, Citrine is weak and fleeting and a tad dull. If you want to know what Citrine really smells like, spray it on with gusto, then all its facets shine. Citrine has very good lasting power and close-to-the-body sillage. Olivier Durbano is “one of those lines” that have always been problematic for me. I love several of the perfumes in the collection but I hate the fact all the scents are available only in 100 ml size. (If you’re only going to sell one size, why not 50 ml?) And the pricing? At almost $200 a bottle, the prices are steep. Still…Citrine is ‘calling my name,’ and only time will tell if I can resist. Olivier Durbano Citrine Eau de Parfum is available in 100 ml, $190. For buying information, see the listing for Olivier Durbano under Perfume Houses. 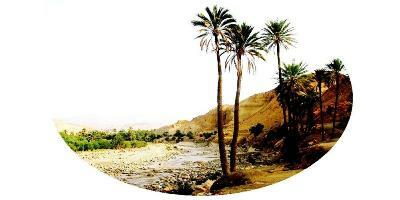 Note: top image of an Algerian oasis [altered], via Wikimedia Commons. Le Critique: hadn’t heard that…too bad if it’s true. Time to stock up? This sounds delightful, Kevin. I almost ordered a Durbano sample from Luckyscent (Black Tourmaline), but decided it was best to avoid any possible temptation to spend ~$200 on a 100ml bottle. Second the request for a 50ml option! I love Rock Crystal and Black Tourmaline. I think I might have to try this one, also…. So glad to see a review of this one—I remember it was on your “best of 2011” list. I’ve been wavering on this for a couple of months—and have not yet tried it sprayed, only dabbed, and have almost come to the end of my sample. It’s the first one of his I’ve really liked (well, I like Black Tourmaline a lot too but can’t imagine wearing it often). Completely agree on the 100 ml bottle! Sounds wonderful, Kevin. It has all the scents I adore and I love wearing men’s fragrance too, so I think I’ll try this one.